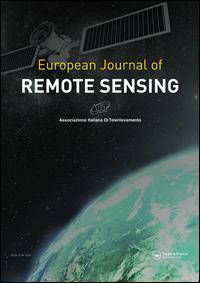 Following the acceptance of the abstract and your registration to the Workshop at the Conference Tool, authors are welcome to submit full papers, to the open access European Journal of Remote Sensing. The EuJRS has an IF of 1.5, is online and open-access and a special issue will accommodate full paper submissions related to the presentations delivered in the Workshop. EARseL will be subsidising part of the fee for the publication of the full papers in this special issue. A strict deadline for full paper submissions, as well as details on how to submit your full publication, using the EuJRS web page, will be provided after the notification of authors for acceptance of abstracts. The peer-review process of EuJRS will be followed and accepted submissions will be published as soon as possible. A special agreement has been made between EARSeL and Taylor & Francis on a reduced publication cost for authors publishing in the EuJRS special issue. EARSeL will support authors by paying 50% (EUR 150) of this publication cost. The remaining 50% (EUR 145) will have to be paid by the author as soon as the paper has been accepted by Taylor & Francis and before publication in the EuJRS . Following the acceptance of the abstract and your registration to the Workshop at the Conference Tool, authors are welcome to submit full papers to the international and cross-disciplinary open access journal, /Land/ (ISSN 2073-445X, http://www.mdpi.com/journal/land). /Land/ has been indexed in the Emerging Sources Citation Index (ESCI – Web of Science) and Scopus. 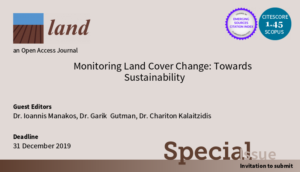 The Special Issue of “Monitoring Land Cover Change: Towards Sustainability” will accommodate full paper submissions related to the presentations delivered in the Workshop and the Symposium. Please check more details here. Rapid publication: manuscripts are peer-reviewed and a first decision provided to authors approximately 20.5 days after submission; acceptance to publication is undertaken in 6.3 days (median values for papers published in this journal in 2017). Free Publication: /Land/ will waive Article Processing Charges (550 CHF) for the submissions from the Workshop and the Symposium. However, if there is additional charge, like English editing, authors need to pay for this or ask native English speaker colleagues to help.